Gatlin's BBQ is just one of several Houston-area barbecue joints open on Independence Day this year. Photo by Scott Sandlin. If your backyard barbecue skills leave much to be desired, there’s no need to fret. 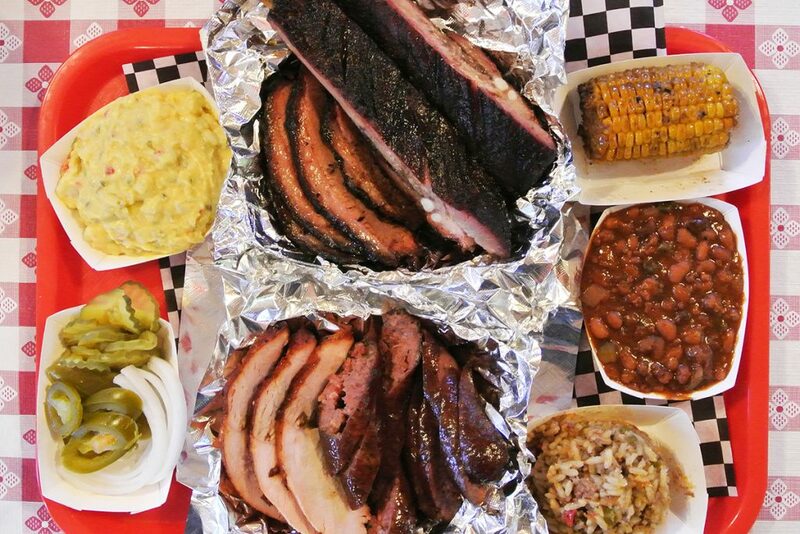 There are several quality Houston-area barbecue joints that have their pits loaded up and are ready to serve you this Independence Day. Whether dining in or looking for takeout for a gathering with family and friends, Houston pitmasters are available to help. The Brisket House, 5775 Woodway, 3301 Cypress Creek Pkwy, and 3217 Center St (Deer Park): Pitmaster Wayne Kammerl has all three Greater Houston-area Brisket House locations open for the 4th of July. Stop by for some tender, smoky brisket—still one of the best values in the area at $15.95 per pound. Or try Wayne’s PB&J, a delicious three-meat sandwich on a jalapeno cheese bun we featured earlier this year in our “Incredible Feasts on Buns” article. El Burro and the Bull, The Conservatory, 1010 Prairie: John and Veronica Avila will be open from 4 p.m. until midnight in their Downtown Houston location. In addition to the regular barbecue menu, El Burro and the Bull will have turkey tacos on special, served on corn tortillas, and dressed with a citrus avocado slaw and cotija cheese. The cost is $11 for two tacos and one side. Beef plate rib, smoked turkey, brisket, and pulled pork from CorkScrew BBQ. Photo by Scott Sandlin. 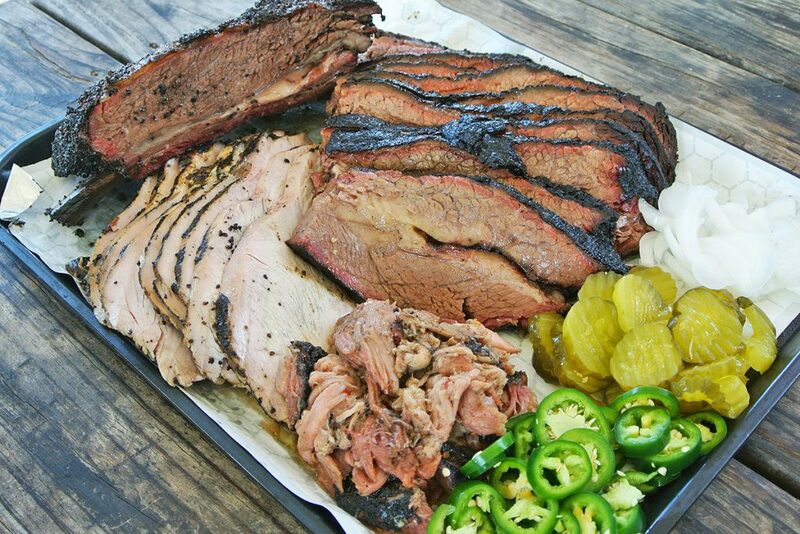 CorkScrew BBQ, 26608 Keith St., Spring: The newly minted Texas Monthly Top 10 Texas Barbecue destination will open at 11 a.m. on July 4 for a day filled with music by Josh Norman, a outside beer bar, and icy treats by Snow Angel Snow Cones. Get there early, because the barbecue typically sells out fairly quickly. Gatlin’s BBQ & Catering, 3510 Ella: Greg Gatlin and his talented crew are working this Independence Day from 10:30 a.m. to 2 p.m. There are brisket, ribs and sausage, of course, but don’t skip their dirty rice. It’s his mother Mary’s recipe. Special items are listed on the menu board daily. Killen’s Barbecue, 3613 East Broadway, Pearland: Killen’s is serving their full menu, but will only be open from 11 am to 3 pm (or until sold out). Stop in and try the new Snake River Farms brisket, Duroc pork ribs, tasty pulled pork, and his famous creamed corn. Be sure to pick up some banana pudding or bread pudding for dessert. Better yet, just skip the dilemma and get one of each. Luling City Market BBQ, 4726 Richmond: A favorite of folks who work in and around the Galleria area, Luling City Market will be open from 11 am to 5 pm. Stop in for some of their delicious house-made sausage rings, in both beef and jalapeño cheese varieties. Palomo Pit BBQ, The New Potato Bar, 3519 Clinton: Jose Palomo regularly pops up at The New Potato bar on Saturdays on the east side. For a special July 4th service starting at 3 p.m., Palomo is serving $1 brats throughout the service, in addition to brisket, pork ribs, sausage, lamb racks, prime rib and beef ribs. As a bonus, The New Potato has live music starting at 5 p.m., and is dog and family-friendly. 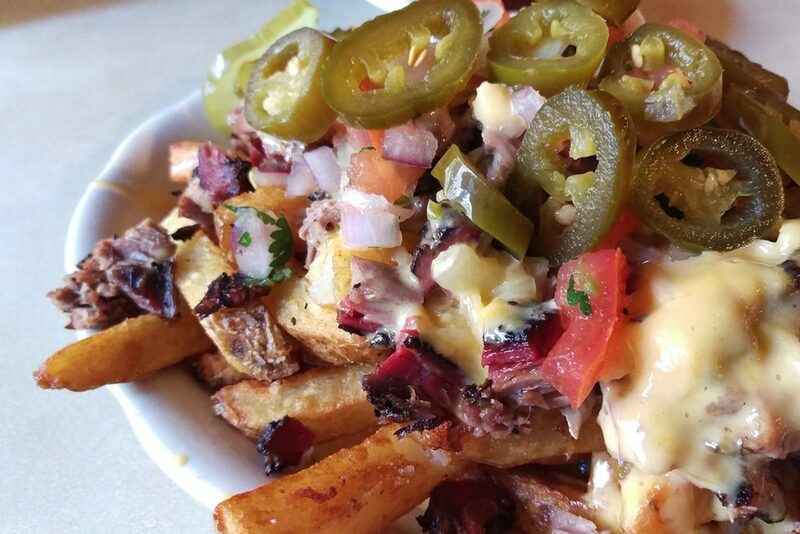 Chopped brisket cheese fries from Pappas Bar-B-Q, topped with queso, fresh pico de gallo, and sliced jalapeños. Photo by Scott Sandlin. Pappas Bar-B-Q, multiple locations: All Pappas Bar-B-Q locations are scheduled to be open from 11 a.m. to 10 p.m. to satisfy your barbecue cravings. Value packs on their To-Go Menu are also available for pick up in several package sizes, and include all the trimmings. Pro-tip: order your beef freshly “board chopped” for your baked potatoes or cheese fries; it’s infinitely better than the pre-made, pre-sauced chopped beef. The Pit Room, 1201 Richmond: Despite having a large quantity of bulk to-go orders to fulfill on July 4, The Pit Room is open regular hours from 11 a.m. to 9 p.m. or until sold out. The full menu will be available as long as it lasts, and The Patio on Richmond next door will be open until midnight. Pizzitola’s Bar-B-Cue, 1703 Shepherd: Pizzitola’s has full racks of their famous spareribs available for preorder and takeout only from 10:30 a.m. to 1:30 p.m. The cost is $24.95 per rack. More information is available on their website. Ray’s BBQ Shack, 4529 Old Spanish Trail: Special holiday hours at Ray’s BBQ Shack are from 10 a.m. to 3 p.m., and the full menu is available. Ray’s can meet all your barbecue needs, but if you’re in the mood for something different, they also serve excellent fish and shrimp baskets, burgers, and po-boys. Roegels Barbecue, 2223 Voss: Russell Roegels reported late Monday that his pits are loaded will all their delicious smoked meats, and will be open from 11 a.m. to 3 p.m., or until sold out. About twenty pre-orders will be headed out the door at 11 a.m., so be sure to get their early. Roegels’ Texas Monthly Top 50 ranking has resulted in steady crowds and earlier than normal sell-outs since late May. The “Taste of the South” sampler at Southern Q, served with brisket, ribs, turkey, sausage, potato salad, beans, Cajun rice, and grilled corn, $26.95. Photo by Scott Sandlin. 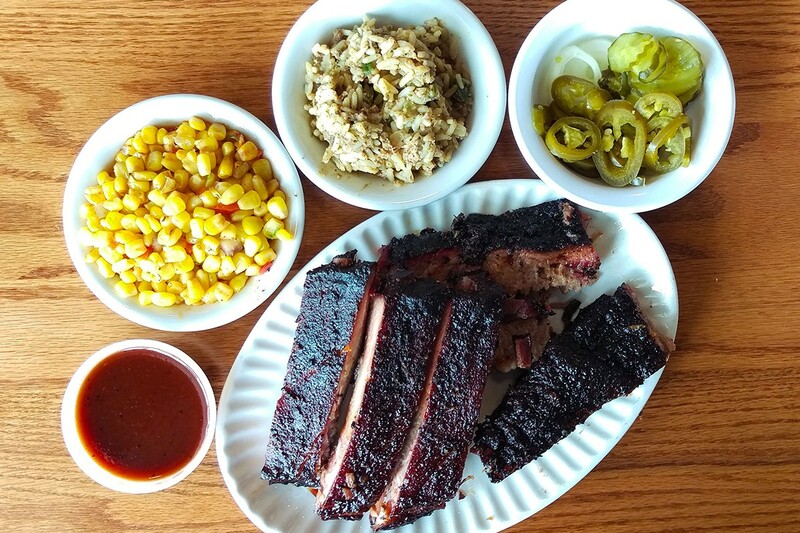 Southern Q BBQ, 16540f Kuykendahl: A north-side favorite, pitmaster Steve Garner and his wife, Sherice, turn out some of the best Southeast Texas-style barbecue in our area. Find them on the east side of Kuykendahl, about one mile north of FM 1960. In addition to all the regular smoked meats, pick up some smoked boudin and house-made fire crackers. Southern Q will be open July 4 from 11 a.m. to 4 p.m., and then the Garners are taking a week off for some rest and relaxation. Southern Q resumes normal hours on Friday, July 14. Tin Roof BBQ, 18918 Town Center Blvd., Atascocita: For a family-friendly dining destination with multiple menu options, there aren’t many places like Tin Roof BBQ. With a large playground for the kids and an expansive adjacent outdoor deck so you can keep an eye on them, there’s something here to please everyone. Independence Day hours are 11 a.m. to 9 p.m., or until sold out. In addition to the full menu, they are serving a special “1776 Platter” that includes brisket, a pork rib, two varieties of sausage, and a smoked pork chop, for just $17.76.